Q:Where did the idea for Gormley & Gamble start? I started interning on Savile Row aged 15, and have always been fascinated by tailoring. I enrolled to study Costume Design at university but felt so unstimulated and unenthused by the lack of contact time. 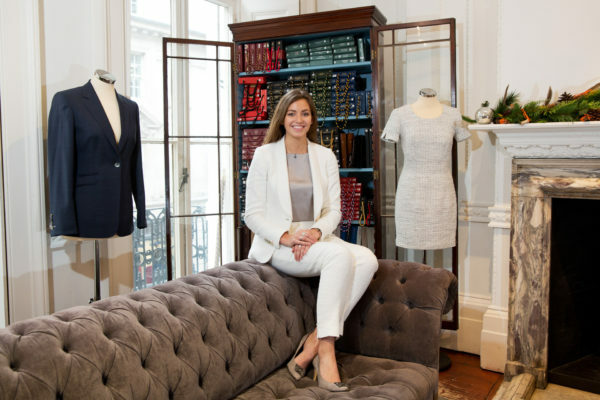 I began to draw up business plans for a women’s only tailor and soon began to realise that as well as being a viable option, there was a real want and need for beautiful, bespoke classics for women. I submitted the business plan to my parents on a Friday, and by Monday was down in London looking for suppliers. Q:Have you always been interested in fashion? I do love clothes, and dressing women, however I think of G&G as more than just a fashion brand. We provide a whole experience for our customers; taking into account their entire lifestyle, not just wardrobe preferences. Q:Whose been your most exciting client? We have a lot of exciting clients, but in tailoring discretion is key; the trust between tailor and client is key. Having said that, one of my favourite clients is probably Donna Ida of Donna Ida Denim. We made her a blue velvet jacket and she rocks it with her signature jeans – they are amazing. Q:What’s your favourite item that you’ve designed/sold? I have two favourite suits; one bright red evening tuxedo with spray-on trousers – I wore it in a photoshoot for Marie Claire. More recently I made myself a similar double breasted jacket in dusty pink with some flared trousers. It is so fun and I can’t wait to get it out in the summer. Q:What experience does someone need to work for you? We are very open-minded about experience levels and backgrounds. What I value more is someone who can demonstrate that they are a hard-worker and can think on their feet. We are a small and very busy team so an employee or intern needs to be able to manage their own time and work independantely. Q:Where did you start university and why did you leave? I went to Nottingham Trent University. I left because it was the complete opposite of what I expected. I wanted to be challenged and stimulated, but only ended up with 2 hours of lectures a week. That amount of contact time for the fees I was paying was absurd. Q:Do you ever regret your decision to have left? No, never! My life is so different to how it would have been if I stayed on. If I’d completed a degree I don’t know if I would have taken the leap into starting my own business. Q:What’s the best thing about starting a business? My customers. I love the women I get to meet and dress every day. I am so close to some of them now that they sit on my board of advisors. Q:Where do you see yourself in 10 years’ time? My ten year dream is to open my own store for female entrepreneurs. There are so many female-lead businesses out there that fall under the radar. A beautifully curated, central London department store would be an amazing platform to showcase some of the talent out there – across a variety of sectors. Q:Advice to any entrepreneurial or fashion keen school leavers? Ask for help! Make the most of your network and talk to people. The advice and experience of others has definitely shaped my company, and I wouldn’t be where I was okay if it wasn’t for the help of friends, parents and mentors.